Home » EV Concept » New 3D microbatteries recharge 1,000 times faster than competing tech. 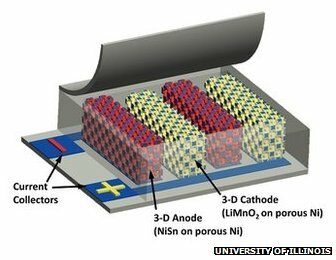 New 3D microbatteries recharge 1,000 times faster than competing tech. Though they be but little, they are fierce. The most powerful batteries on the planet are only a few millimeters in size, yet they pack such a punch that a driver could use a cellphone powered by these batteries to jump-start a dead car battery – and then recharge the phone in the blink of an eye. With so much power, the batteries could enable sensors or radio signals that broadcast 30 times farther, or devices 30 times smaller. The batteries are rechargeable and can charge 1,000 times faster than competing technologies – imagine juicing up a credit-card-thin phone in less than a second. In addition to consumer electronics, medical devices, lasers, sensors and other applications could see leaps forward in technology with such power sources available.